Design patterns in life and Ruby — gain an intuitive understanding of OO design patterns by linking them with real-life examples. If you listen to podcasts, you are already familiar with the Observer pattern. 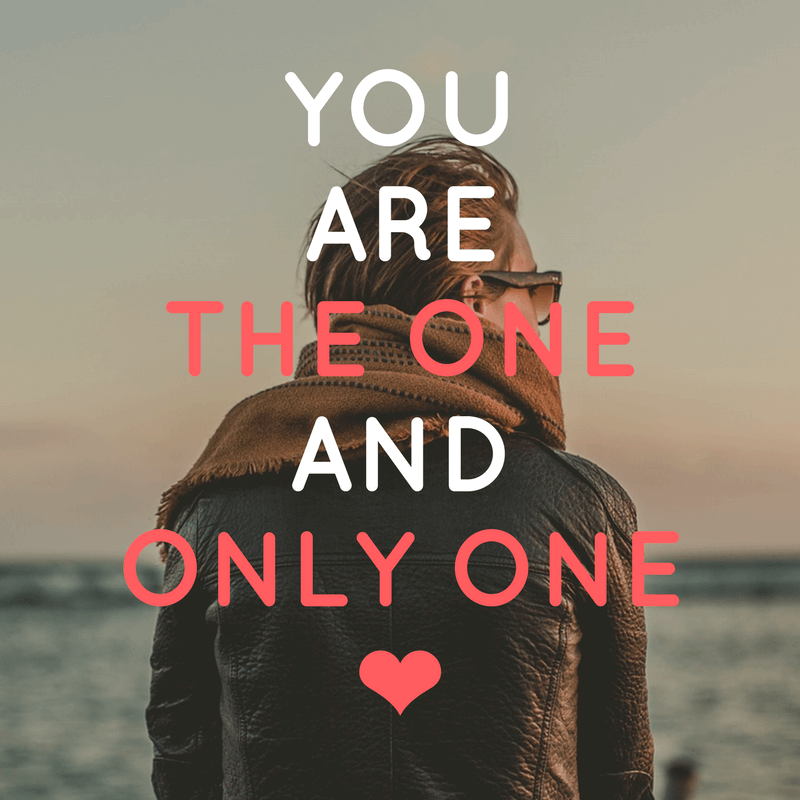 In fact, you are an “observer”. The Observer pattern defines a one-to-many dependency between objects so that when one object changes state, all of its dependents are notified and updated automatically. Let’s look at the definition as related to podcasts. I find an interesting podcast named developer tea. After clicking the SUBSCRIBE button, I’m now on their subscriber list. 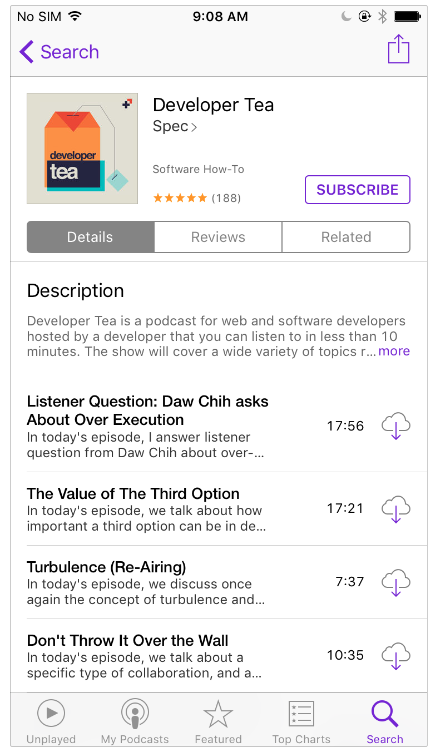 When developer tea releases a new episode, the Podcasts app will notify me and other subscribers and automatically download the new episode for us. That’s exactly the definition of the Observer pattern! 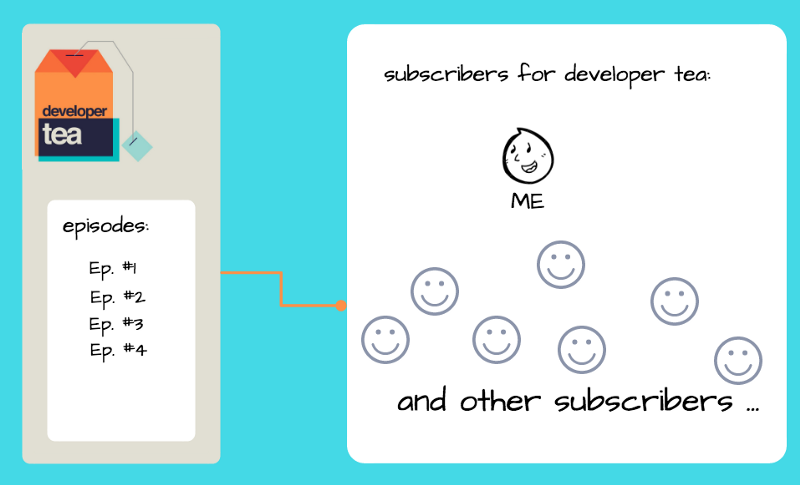 There is a one-to-many relationship between the developer tea podcast and subscribers. When developer tea chanes state, such as releasing a new episode, all of developer tea‘s subscribers are notified and updated automatically. Let’s implement it in Ruby. Start with a simple version. The Podcast class holds a list of episodes and has a method to add_episode to the list. I want to get a notification whenever a new episode is released. And whenever I get an update from developer_tea, I can go ahead and download the latest episode. I enjoy listening to developer_tea so much that I recommend it to my friend, Amber. Now, Amber wants to subscribe to it as well. Hmmm, now, the code does what we want. Each time we want to add a subscriber, we have to redefine the class. Is there a way to update the subscriber list dynamically without having to redefine the class? We can keep a subscriber list! The new Podcast class keeps a subscriber list with the help of two new methods: one for adding subscribers and one for removing subscribers. When an episode is released, we update each subscriber. Unfortunately, Amber doesn’t enjoy the podcast as much as I do and decides to unsubscribe. We use the remove_subscriber method to remove her from the subscriber list. Yay! You learn the Observer pattern! A Design Principle Behind The Observer Pattern. Strive for loosely coupled designs between objects that interact. 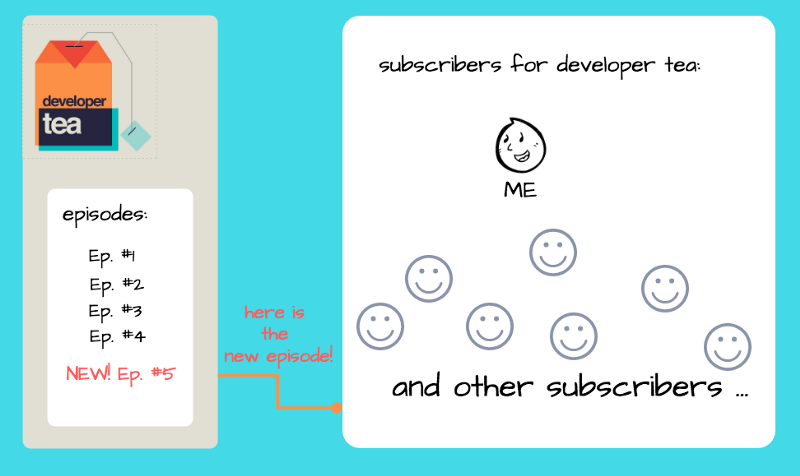 The Podcast class doesn’t know much about its subscribers besides the fact that each subscriber has an update method. 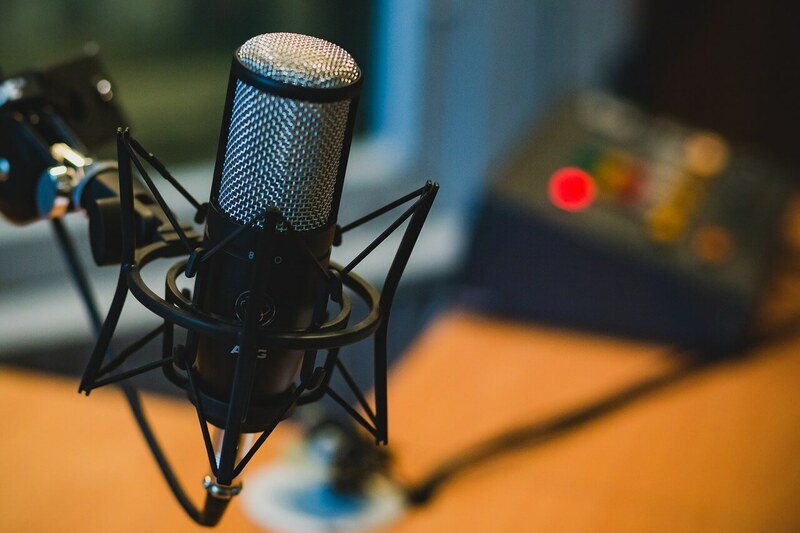 This loose coupling minimizes the dependency between Podcast and its subscribers and maximizes flexibility. 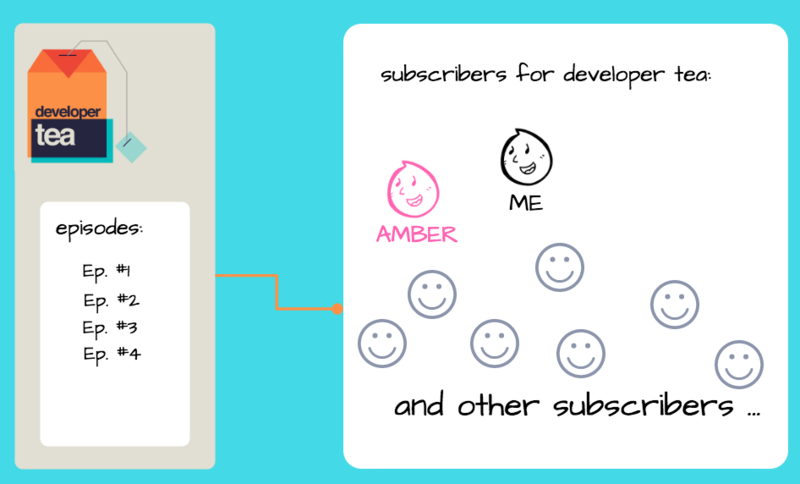 As long as it has an update method, a subscriber can be anything: a human, a group of people, an animal, or even a car. Loose Coupling design principle: strive for loosely coupled designs between objects that interact. Thanks for reading. Are there any other real-life examples of the Observer pattern you can think of? My best content on Software Design, Rails, and Career in Dev. Delivered weekly. Frustrated Learning Rails? Here is What You Should Do. ← Stop Thinking Like A Developer. Think Outside-in. How do you find these real world examples? Sihui. It’s pretty easy to understand. Hi Bhanu, I’m glad you find it easy to understand. I found these examples just by thinking about the concept and try to draw analogies.